So much for our nice clean floor. 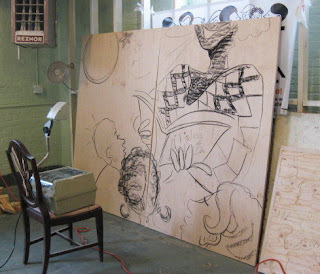 I got to the Studio in the early afternoon and found that Molly had indeed been busy yesterday as she planned. 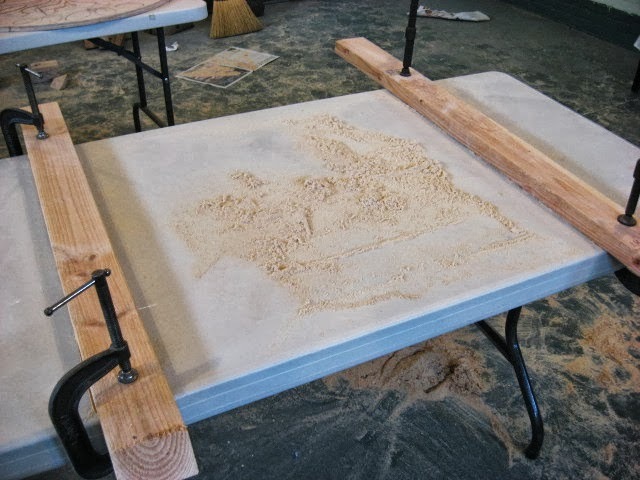 No problem for me, since she is the one more concerned with sawdust and its effect on the pouring of the protective coating on the tables. A lot more sawdust will be created and swept before she's ready to do some of that. I only created a little dust today, using the mitre saw to cut the last eight of the 4x4 legs, as well as the four 2x2 legs. Unless something changes, all the legs are now cut. Can't put the saw away quite yet, because I still need to do frames for three tables, which will require more wood. And most of the legs are still waiting sanding. After that was done, I decided to assemble another tabletop and frame. This isn't one of the immediate priority tables, but it had to be done eventually, and I want one ready to go that I can use to test fit the leg assemblies I'll be making in the near future. Perhaps I'll start that process later this week. I was busy down at the Belmar Arts Council early in the day, so Molly beat me to the Studio. She was busy working on some drawing when I arrived, having finished doing some routing on the coffee table piece. We spent a little time going over the schedule of things needed for the next week. 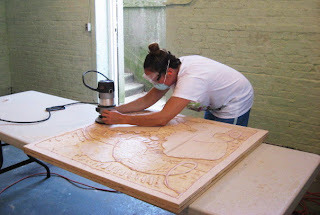 She would like me to finish the sanding as soon as possible, so that dust is not around as much for the painting and especially when she is ready to pour to coating on the table tops. I don't blame her- this project has generated a lot of sawdust. Even the parts of the room well away from the saws, sanders, and router have a coating of sawdust almost everywhere. After a quick photo session (apparently my head will serve as a model for a kid listening to a story) I left Molly there to concentrate on her process for the remainder of her available time today, and I wandered over to Cookman Ave where there was a little art festival going on. Art was being shown in a bunch of spaces, including some galleries I had never seen before. Also ran into a lot of friends, which I had expected. Didn't see any life altering art, but it was a lovely afternoon to be out walking. Went back to the Studio and found Molly gone, along with most of the sawdust on the floor. I wanted to get a little work done before going home, so I set up my sanding system again and sanded the four legs for the coffee table. The set up looks a lot like the last time I did this, but the legs were only half as long. Still took almost as much time to sand as the full length legs. Inspired by Molly's clean up effort, I not only cleaned all the sawdust from my table (which I do every time anyway), but I also took the broom to some of those dusty areas at the far back of the room. The parking lot was starting to fill with people coming for the Gospel Explosion event, so I decided to end my work day and get home. I much prefer a Blues Explosion myself (as in Jon Spenser), but that's my tastes. Molly's short term requests were all met by Monday, but there is still more work to do. 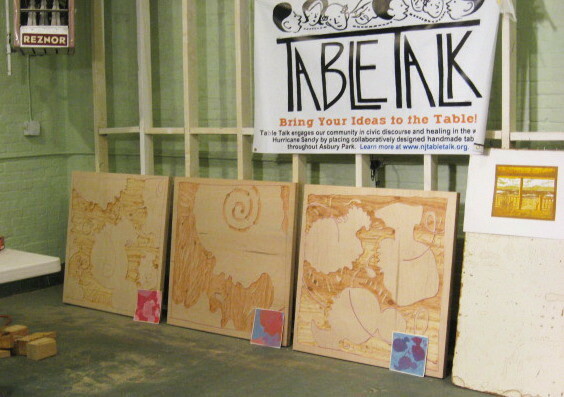 When I arrived at the table shop today I found that the three tables worked on a few days ago were all gone, no doubt at the locations for planned workshops. I figure those two long tables will need legs soon, so today I took care of sanding them. 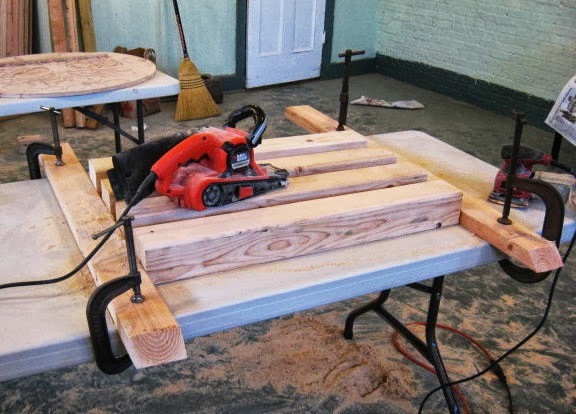 Items have to be secured before using the belt sander on them; if I just tried placing them on the table, friction from the powerful belt would just shoot it off the table. 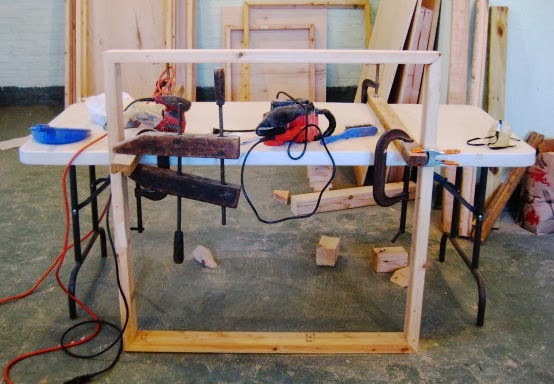 Simple solution was to brace them with 2x4's clamped to a table, as in the above photo. I put out four at a time (a complete table set), and did the top sides with the belt sander, then the palm sander. Then flip all four to the next face and use both sanders again. Repeat until all four sides are done. After the first four were done I put them aside and cleaned up a little. 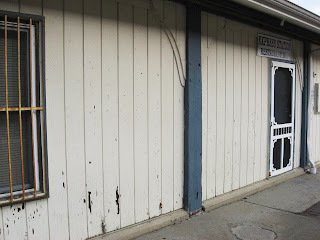 The sawdust you see above between the boards is most of what came off those four legs. That's why I wear the uncomfortable dust mask and safety goggles. Just as I finished the second set of four I heard a pounding on our door to the outside. It was Molly, there to drop off some stuff, and figured since I was there she could use the shortcut right to our space. She liked the legs, but assumed they were the short ones for the coffee table. I told her these were the standard length ones for several tables, and stood one on the floor next to the work tables to prove it. I'm not surprised by her confusion. I remeasured the first ones at least 3 times, including bringing one down to the print shop to compare with those work tables, just to make sure they were the right height. Laying on table, they just seem short. I completed two sets of four legs, enough for those two long tables. I have six more sets cut, so if Molly gives me no specific requests, I have stuff to keep me busy the next few times I come in. Probably next I should put together the materials list for the items we still need- more wood, wood filler, etc. And there's working out the plan for the drop leaf table. Call it job security. 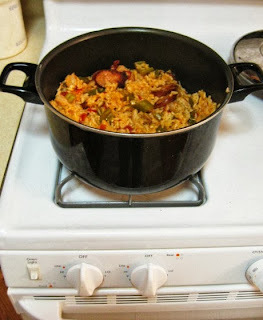 On the way home I stopped at the store and bought the rest of the ingredients that I'd need to make a batch of jambalaya. Nothing to do with this table thing, but it is tradition here at Arrabbiata to celebrate all spicy foods, and this is the first real meal that I've cooked in my new apartment. Got up to the Studio around mid day today, and was surprised to see the door open, as I wasn't expecting to see Molly there at that time. And I didn't, but she had some other volunteer help there to advance the project. Meanwhile I went on with my tasks. 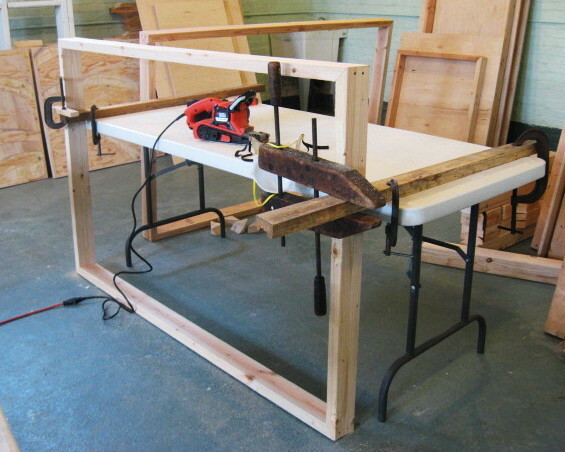 I attached the frame I completed on Saturday to a 3' x 4' table (above), and sanded the underside of the frame (and those assembled on the weekend). This table is going to be more like a coffee table, so I cut much shorter legs than usual, only about half the length of those I did for all our other tables. 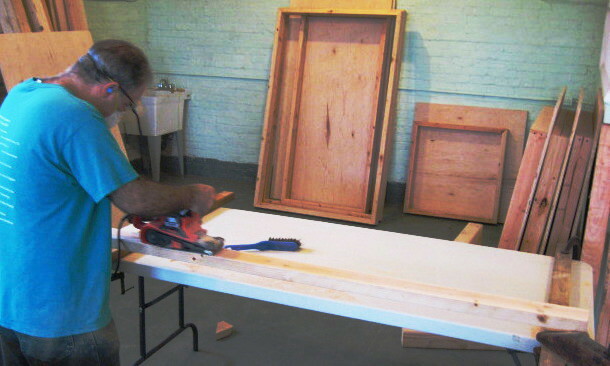 As I was doing that, a worker who wishes to remain anonymous was applying a coat of primer to both sides of those long tables I assembled on Saturday. 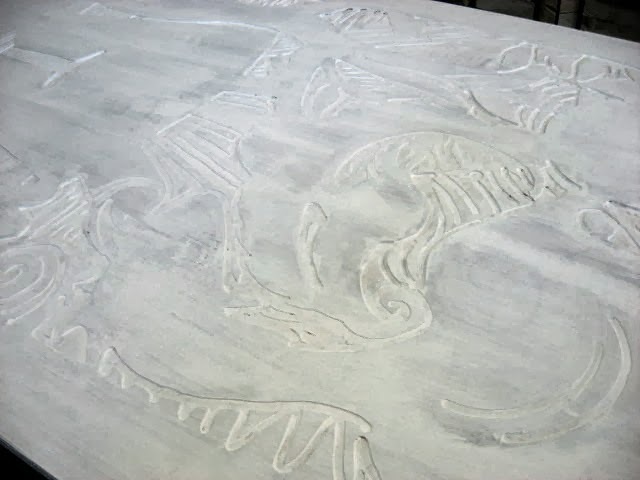 Even with the drawing completely obscured by the paint, the relief carvings show through. Molly never did show up today, and I got busy and forgot to call her. If I haven't heard from her by my next available work day I do have something to keep me busy. I can start sanding all those leg pieces I cut a few weeks ago. Molly had given me a long list of things to get done for next week, and with no other commitments for today, that meant a shift in the Studio. 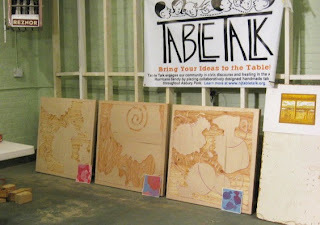 Above are the two tabletops for Park Place, which she was sketching a few days ago. Obviously she got to one with her router since then. She needed the frame attached to the table top for each. I had assumed she'd just want a screw in each corner, but she wanted extra strength and suggested one on each side, too. Problem- those oval shapes she drew are sitting right over the middle points of the frame on all four sides. The solution we came up with was to put two screws in each corner, one on either side of the corner itself, for a total of eight screws. In each case, I first lined up the frame on top of the design with an even 3" margin all the way around, and traced the corner spots. I put the frame aside and predrilled pilot holes with the electric drill, and then used my old brace a bit drill to widen the top of each hole so I would be able to recess the screw head. 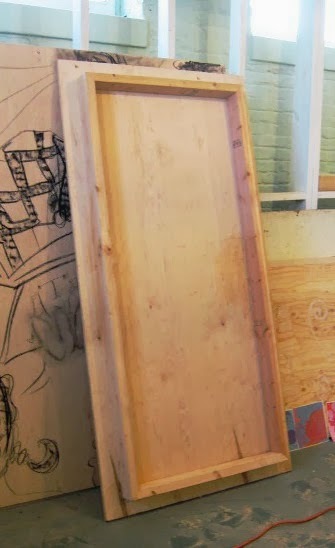 Then the top was carefully placed back on the frame (a little wood glue in between- don't know if it would make a difference, but it couldn't hurt), lined up, and the screws driven back down through the top into the frame. Photos above and below show how it looked from top and underneath. But that wasn't all for today. 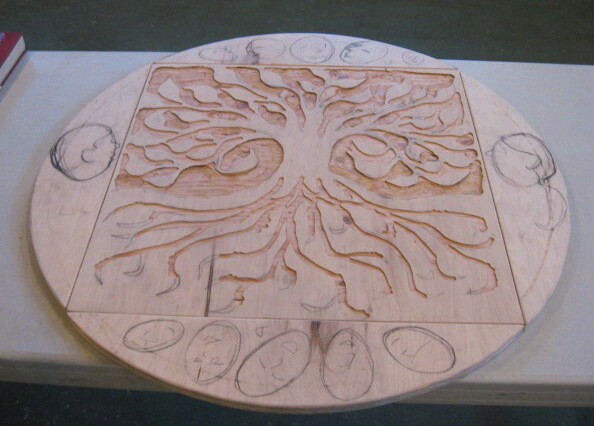 We had gotten the details for an additional table, something more like a coffee table. I had verified on Thursday that we had enough wood to do it, and Molly had trimmed down a piece of plywood to the desired dimensions. I got out the miter saw and cut some 2x4's to the proper lengths to build the frame, assembled it, and even did the sanding for the exterior. I held off on attaching it, figuring I would try to talk to Molly first and see if she cared where the screws went. Nothing is sketched yet on the top. 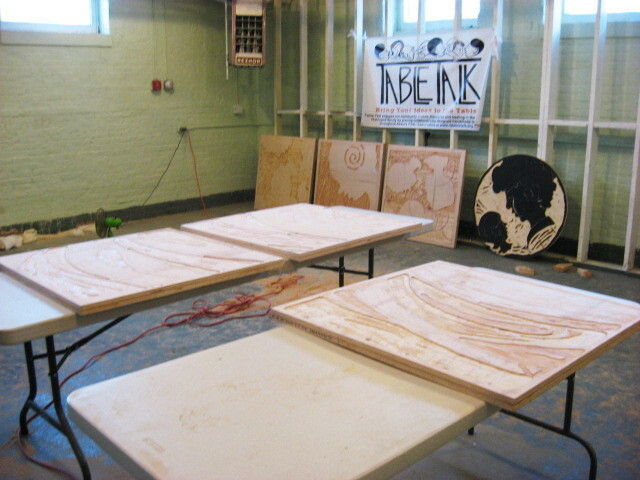 Then it was time to clean up a bit, and then down to the print shop to do preparations for a class project next week. Tomorrow I have other plans, but I should be able to do the rest of what needs to be done early Monday. Knowing that Molly wanted to get a few of these tables closer to assembly by early next week, I figured I better put some time in on the project today. 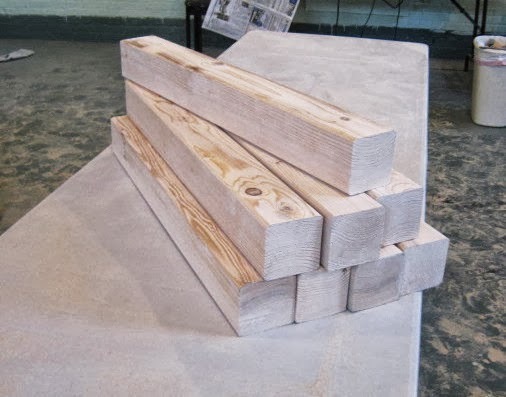 I had two more of these square table frames to finish sanding, and so that step is now done for the exteriors of all the frames that are already constructed. The undersides all need to be done, but again I felt it best to let the sander rest a while. Molly came in as I was finishing up the last frame, and took some stuff over to the cafeteria so she could spread out and start sketching. These are the two tops for Park Place, which she wants to bring over there next week. We finalized the assembly plans for next week. Over the weekend I am going to attach the frames to these two large tabletops, and completely construct a new one, a coffee table type piece for Bella Terra. I did a quick inventory and we do have enough wood in stock to do the job, but we definitely need to put more on a shopping list soon. Things have been quiet here on the blog for most of the past week. Three teaching days are part of that, but the biggest thing is I have been dealing with is moving into a new apartment. All the big furniture that took assistance has been moved, so now it's just dealing with all the boxes and piles of accumulated stuff. Not for the first time I have come to the conclusion that I have too much stuff. But that's a concern for the future. Today I needed to get back to work on this table project. In my absence, Molly did some work of her own. 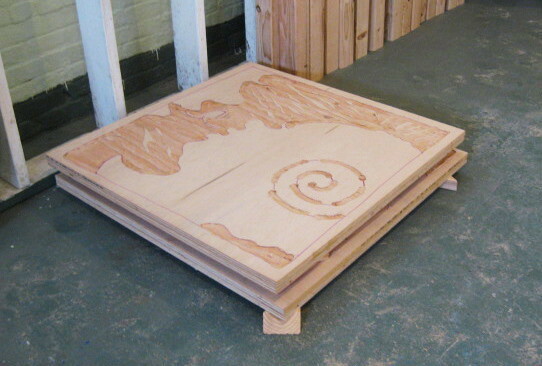 Above is the start of the tabletop for a round drop leaf table. My task continues to be sanding. Last week I had started sanding the 2x4 frames that will connect the legs to the tabletops, and I started with the frames for the four largest tables. In the above photo from last week you see me sanding one of the long sides of one such frame (mounted on supports clamped to the work table) and more of the 5.5 foot long frames in the background. I had done the long sides of all four frames this way, but now I had a problem. 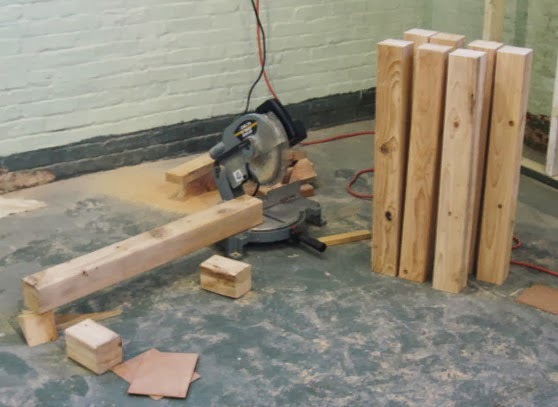 It is far far easier to use a belt sander on a firm horizontal surface. To try sanding a vertical surface seemed at best inefficient, and at worst, possibly dangerous. 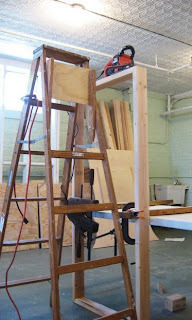 And no man in my family is tall enough to see top of a 66" long frame. After thinking about it for a few minutes I came to a conclusion- I needed to get taller. 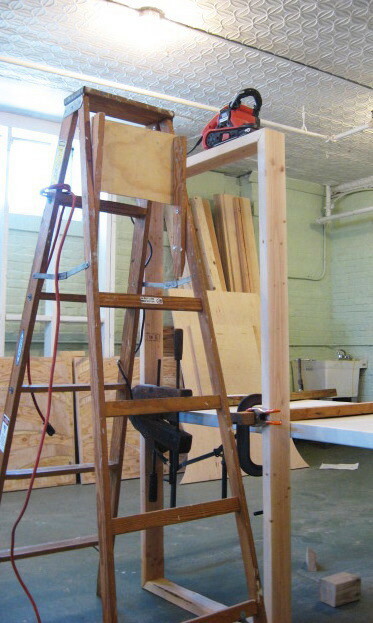 Unfortunately my legs stopped growing a few decades ago, so I turned to a ladder for assistance. 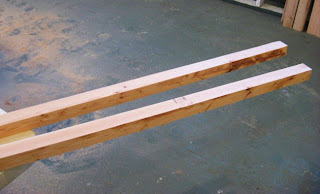 I clamped wooden supports to the table again, but with a narrower gap this time to hold the 3 and 4 foot wide sections. 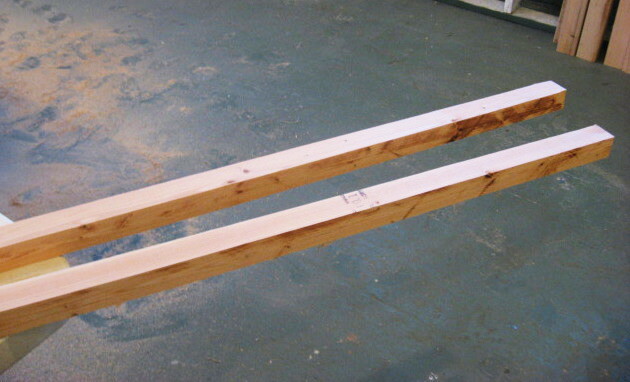 A couple of rungs up the ladder, one foot resting on the table for stability and balance. Otherwise it was the same routine as last week- first some passes with the belt sander to take down the rough stuff, then a few with the palm sander to smooth things out. 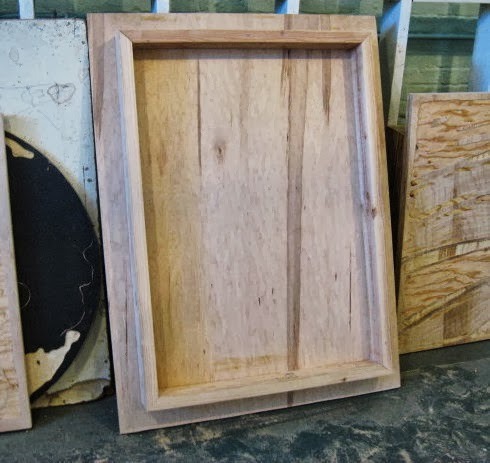 With those four large frames done, I turned to the yet untouched square frames, which also were all 3 and 4 foot wide. Got through a few of those as well, and considered finishing the last two, but the belt sander was starting to get warm, and I don't want to burn this thing out in less than a week, so I decided to clean up and go home. The plan for tomorrow is to knock out the exterior sides of the last two assembled frames, then start on the undersides, but for those the frames can just sit on top of the tables. Later I updated Molly by phone on what I had accomplished today. She put in a request to prioritize certain tables to be available for some planned workshops, something I should be able to tackle on the weekend. When I arrived at the Studio this morning I saw that Molly had carried through with yesterday's plan to start drawing more tabletops. I believe what is shown above is the start of her sketch for the Boys and Girls Club tables, which can exist as two tables or be put together to create one design. Molly was there in the building, but when she heard I was going to be sanding she decided to avoid all that noise and take care of some business in the print shop for a while. Our new belt sander (the above red object) had arrived yesterday, and today I opened the box. I was happy to see that it came with a belt already installed, saving me that task. I decided to carefully read the instructions first. One thing it mentioned was that items to be sanded should be secured in place. I hadn't thought about that, but is made sense. I decided to build a rack to support the biggest frames. 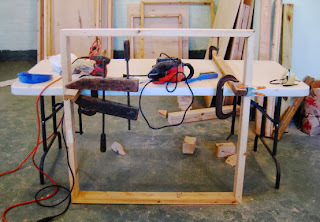 Two pieces of scrap were clamped to one of the work tables, which then supported a four sided frame with the help of a few clamps to keep everything in place. 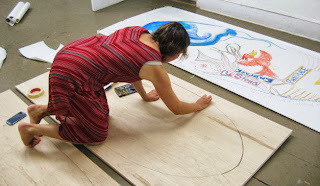 Below, Molly came in long enough to get some action photos of me working on one of the large frames. I used the belt sander to go over all the long sides on the four large frames, and the orbital sander Herb had lent us to give it a more finished feel. I'll have to design a different supporting rack to sand all the remaining parts of the existing frames, so that seemed a good time to put everything away and get ready for class. Had a spare hour in my day early, so I drove up to the Studio to take care of a few things. 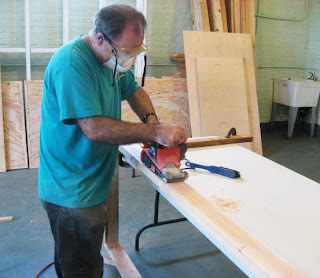 But even before I got in the door I got good news- Herb told me a new belt sander had been picked up for us, so I will soon be able to start on all the sanding of the frames and legs. Meanwhile Molly was finishing something in our print shop while I did some table stuff. I wanted to put a few more screws into one of the cafe tables I had glued for Molly on Saturday, a very quick task. Mostly I was there to glue together pairs of the wood triangles I had cut a few weeks ago. These pieces are part of the leg assembly, and while we only need one piece to hold the lag screws, two provides much more stability, and they're made from 2"x 4" remnants so it adds no cost to the project. 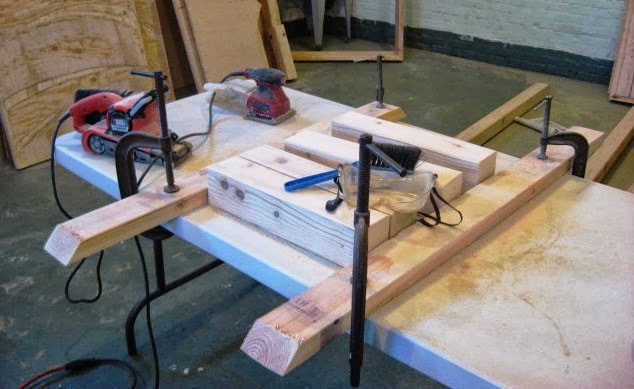 Molly's plan is to deliver the tables with the legs off (no doubt much easier to transport in pieces like that) and then to line up the leg sections and drive the lag screws into pre-drilled holes in the frames. Pre-gluing the corner blocks will just make that easier. Since appearance won't be an issue, so need to clamp these to make perfect seams- the weight of 4"x 4" legs will hold them together until the glue bonds. I did 8 pairs today, and I'll do another bunch another day. I was just about done with my tasks when Molly joined me in the table shop. 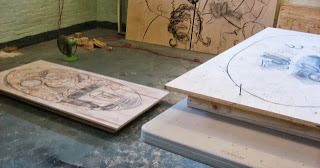 She was continuing work on the tabletops with her router. She told me she was planning to begin sketching some of the other table tops as soon as today. Won't be a conflict for me, since all the sanding will be on frames and legs, and I hope to start that tomorrow. 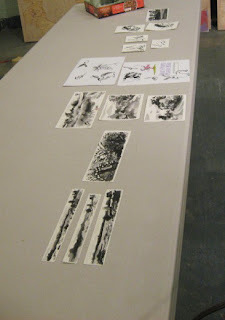 I got up to the Studio in the late afternoon to do some prep work for tomorrow's 3D class. I set up in our classic print studio to work on some sample pieces. Molly showed up about a half hour before the crit was due to begin to set up for the event. 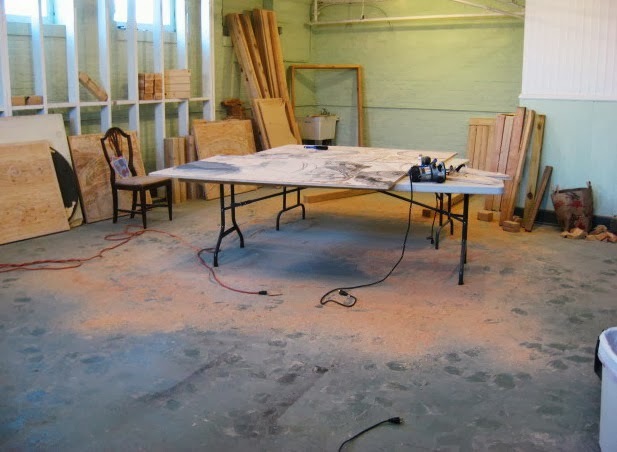 Once again we decided to take advantage of the more spacious room with the tables to be our meeting site- it just needed a thorough sweeping up of sawdust. Besides, Molly's in progress tables were there anyway, and as heavy as those things are, it's much easier to move the people to the tabletops than the tabletops to the other shop. 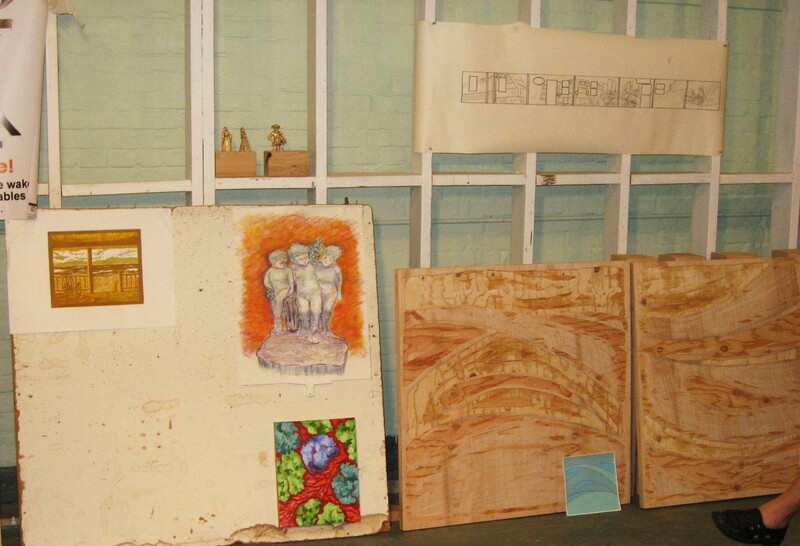 As it turned out, we didn't need as much space as we sometimes do, with only 6 artists present. Most of the art can be seen in the above photo. Top row: clay figures from Margery, and my initial black and white drawing of my mural proposal (the only bit of my own art I've worked on lately) Middle row: the most recent state of a woodcut Mary started during the last workshop, and a pastel drawing from Edy. 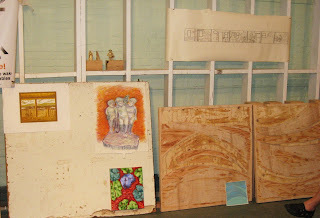 Bottom row, a painting from Edy, and a couple of Molly's tabletops. Above, more of Molly's tabletops with the original sketches. Below, little ink drawings that Molly does when she has a few minutes of downtime in her busy days. Also present was regular member Vince, though he didn't bring any art this time. And as we were putting stuff away, Tim (another of our regulars) showed up, just having gotten out of work. At least they could enjoy some snacks before we closed down for the night. It was table time again today. It appeared that Molly hadn't touched the first three I had glued together (not surprising knowing her fall teaching schedule), and after laying flat for a few days I figured they were safe to move and lean against the wall. Then I repeated the process from a few days ago with the other 3 cafe type tables. Having been through this once before, I was able to work more efficiently this time. 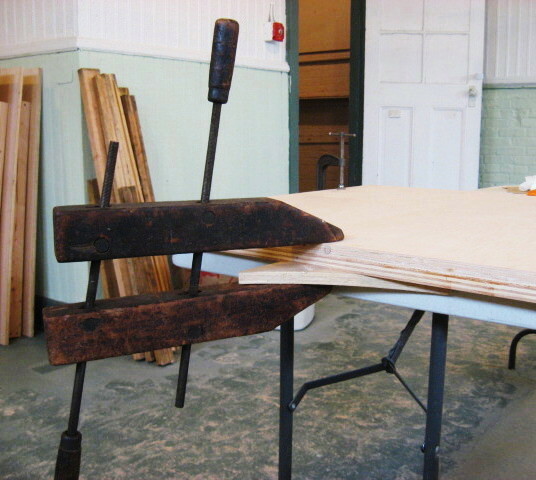 As with last time, I eventually left the three tables from today laying flat on our folding work tables, letting the wood's own weight continue to compress it as the glue finishes bonding. During the time while I was waiting for the clamped pieces to dry I worked some more on my revised plans for the drop leaf table. I think I have a plan that will work, making use of material already in our stockpile, but I'll have to talk to Molly about it before I start cutting anything up. I had some available time in the morning and afternoon today, so up to the Studio to work on tables. Most of the tables that we are making as part of this project are going to have a single piece of 3/4" plywood for the top, attached to a frame that parallels the edges, plus a leg in each corner. However. 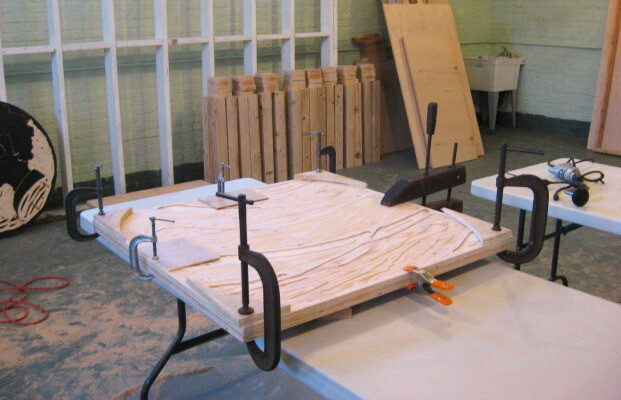 six of the tables will be going to restaurants, and the tops will be mounted on central pedestal with a base. 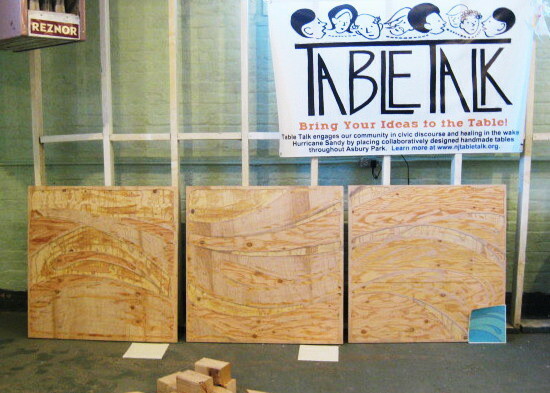 With only a central point to support the tables, Molly decided to double the plywood. (she has made a lot of tables for restaurants, so she knows what she's doing here) She decided to turn this task over to me. I decided to start with the three tables with the head designs, the ones seen yesterday sitting on top of the plastic work tables. The process was simple enough- bring a matching 3 square foot piece of wood over, spread with a thin layer of wood glue, clamp it to one of Molly's carved tops, and then drive screws up through the bottom piece into the top. 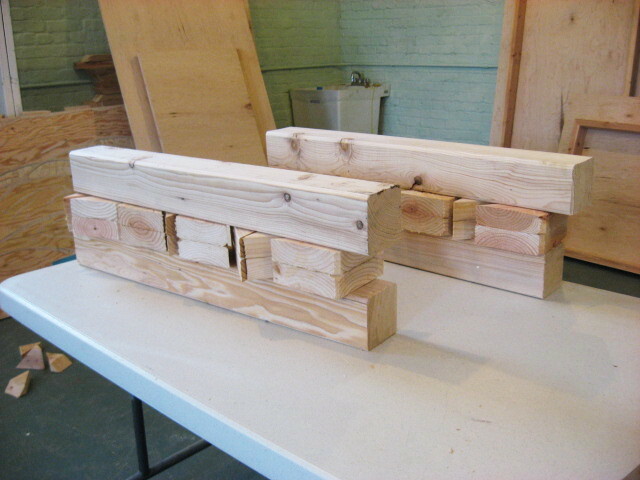 After the clamps were on for the recommended amount of time, I removed them and stacked the doubled tops horizontally to let the wood's own weight keep pushing it together, and used the clamps on the next set. I got the three head tables done before I had to wrap things up and get ready for a class tonight. I put them back up on the work tables should Molly decide to work on them before the next time I come in. Over the weekend I'll do the same steps with the the other three square tables, and then be ready to work on another piece of this job. Had my first day of school yesterday, the class I never taught before. The rest of the week I have classes that I have taught many times, so not as much to worry about. That meant I could get back to the table project today. 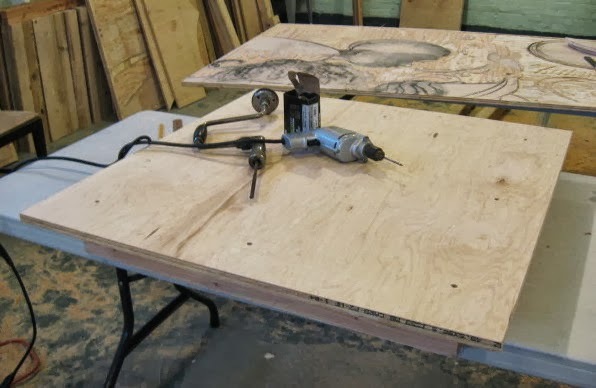 One of the things Molly had put on my list was to take the 6 tabletops destined for locations in restaurants and back each with another piece of plywood, making an extra thick (and extra heavy) table surface. She has started making the tops already. Above she has used a router to carve a design into three boards that will be tables for Langosta Lounge. 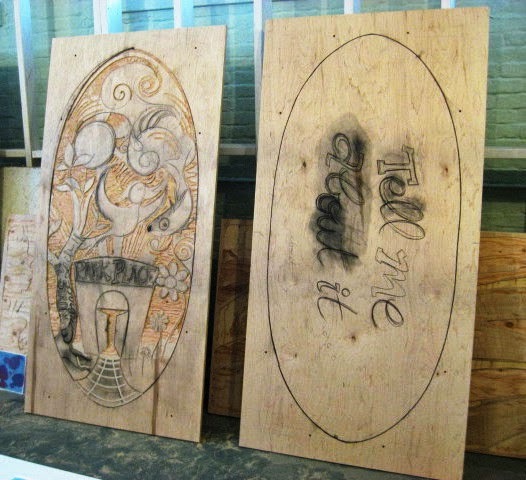 Below are three more table tops which will be at Kula Cafe. 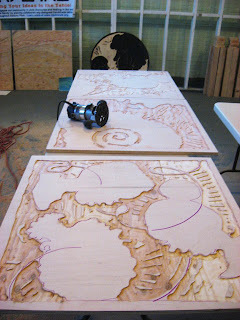 (you may notice the large amount of sawdust on the floor in the two photos) The matching backing pieces are already made, so I'll use a combination of glue and screws to join them together. That doesn't interfere with Molly's process, so I don't need to wait for her to finish. I'll probably work on it tomorrow. I was able to physically work on one thing today. I had decided a while back that the smallest (drop leaf) table wouldn't work with the same 4x4 legs that we'll be using with the other tables, and we decided that the simplest solution would be to take one of the 2x4's that we had left over and rip it down to 2x2 lumber. The building has a table saw in their wood shop, and they agreed to help with this. However, things don't always happen quickly around there, so two weeks after I requested it the original piece of lumber was still sitting in our space. Maybe they're just tired of me asking about it, but when I brought it up today Herb met me down there and we spent the two minutes it took to set up the saw and rip the board. Brought them back to our space for now. Tomorrow I can start working on a design plan for that last table. Things have been quiet around the blog for the past week, but there are some good reasons for that. First of all, my part of the table project is on hold while we deal with some equipment repair or replacement. The building's belt sander is still broken, the person who was repairing it had to be hospitalized (not because of us), and the back up sander that we thought we had turned out to be broken as well. Looks like we may just have to buy our own. (meanwhile, I stopped by the Studio the other day and saw that Molly has begun doing some design work on table tops, so the time is not all wasted) Second, a vicious late summer head cold came roaring through me starting last Sunday. There were a couple of days I never left my apartment and was in no condition to do any building if I had. And third, school starts next week, and on very short notice, I had the class I've taught over two dozen times taken from me and replaced with one I've never taught and just a few days to scramble and figure out the facilities, come up with a curriculum, etc. None of these situations are good, but the combined timing could have been a lot worse. 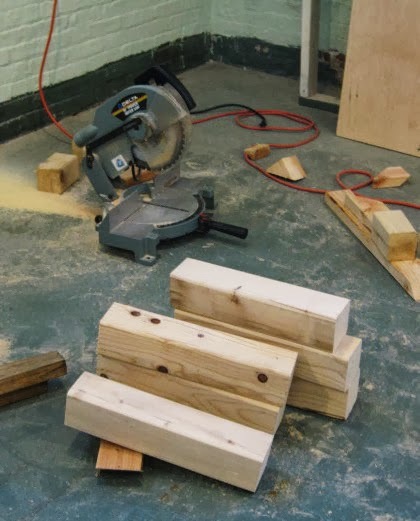 I'd rather be recovering from a cold in the week leading up to the semester than suffering through one on the first day of class, and not having the woodworking hanging over me this week gave me time to work on the school preparations. Last night there was an opening reception in Belmar for a painting themed show, which I naturally declined to enter. The side gallery had a little temporary show of all the mural proposals that had been received, including some artist statements. Those in attendance could vote for favorites. In the end, a committee outside the BAC will make the decision, but the results of that vote could influence their opinions. I figure that means these proposals are now all public information, so I may as well put my piece up on the web. Interested artists were given a tiny scale diagram of the wall surface, about 8' tall, over 80' long, wood paneling, with many interruptions of vertical wood beams, doors, windows, and signs, all of which were to left alone. (the top photo shows one little piece of the wall) At first I didn't worry about that, just collected stories and visuals. Eventually I'd have to deal with this unconventional canvas, and it was almost enough to get me to give up, but so many others were struggling that extensions were given. Finally I finished the first version above, a black and white compositional breakdown. It was a bit grubby from all the pencil erasing, so having made sure I had a little more time, I redrew the whole thing on a fresh sheet of paper and colored it with watercolors. The white spaces all throughout are the architectural pieces that are off limits. Here are some details of different parts of the whole thing, reading from left to right. 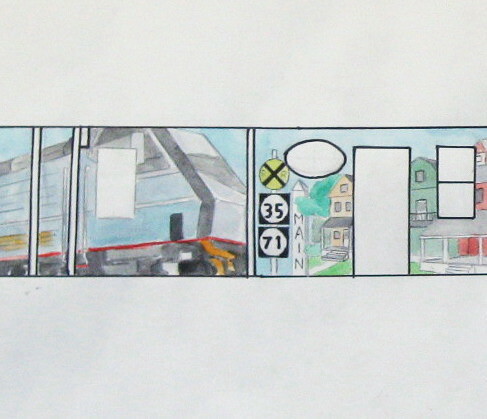 Since the mural is on the train station building, I decided that a train should be part of it. 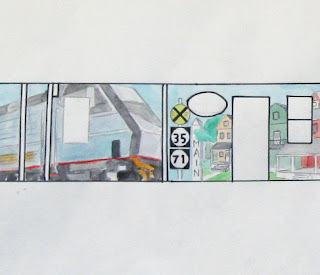 I had considered going with a more historical train, but I couldn't find much in my research, and figured a modern diesel would be a lot easier for the mural team to paint than all the complex shapes of a steam locomotive. This image came from squatting down on the platform in Belmar and photographing it in exaggerated perspective as it rushed into the station. The road signs seemed like simple transitional shapes that would echo the surrounding architecture. Past that a neighborhood of a kind of house I associate with Belmar and other shore towns- large, traditional, with lots of balconies and large porches for enjoying summer days and nights. The houses, with all the windows, doors, and porch spaces, also were hoped to have interesting relationships to the various doors, windows, etc scattered across that area of wall. I continued the rhythm of the angled roofs and station architecture into tent awnings and signs of the Belmar Seafood Festival. It's the town's biggest single annual event, but it hasn't been celebrated in any town murals yet. 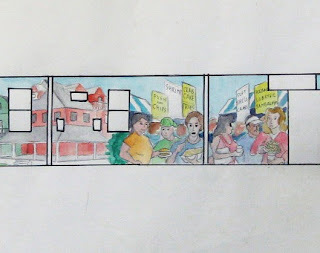 Plus, we were told to think about diversity, and this fair is a model of diversity; just about every culture represented in New Jersey has seafood tradition, so people of every age, ethnicity, and race show up to eat and enjoy the summer weekend. A sign, door, and takeout window pretty much isolate the last piece from the rest of the wall, so no need to worry about transitioning. My last story was the first idea I had, fishing. People have been going out on party boats from the marina (just a block from the train station) for generations and that hasn't changed. 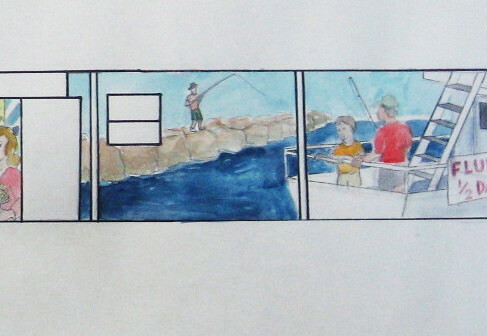 Growing up, fishing was always one of the highlights of my own family summer trips to Belmar. Plus, the large scale boat is meant to balance against the train on the far left. We had a big crowd yesterday, and many votes were cast, though no counts were done, and I still have no idea when a decision will be made. When I know something, I'll post it.